Son of Arnold Denis Donders and Petronella van den Brekel. Peter grew up poor, rarely getting to school, working at home and in a local factory with his brother Martin, and dreaming of becoming a priest. With the help of local priests and a wealthy patron, he enter the seminary at the College of Herlaar at age twenty-two, initially working as a servant while he studied. At age twenty-six her applied to the Franciscans, Jesuits and Redemptorists, but was turned down by each. Ordained on 5 June 1841 after nearly ten years of work. Missionary to the Dutch colony in Surinam, Dutch Guiana, arriving in Paramaribo on 16 September 1842. Evangelized and ministered to plantation slaves, constantly in touch with his superiors to complain of the terrible treatment of the workers. He baptized at least 1200 in his first couple of years, and worked among the sick during an epidemic in 1851. Transferred to the leper colony of Batavia in 1856. There he ministered to both the body and soul of the 600 or so patients. His constant harassment of the colonial authorities resulted in much better care for the patients. When the Redemptorists arrived in Surinam in 1866 to take charge of the mission, Peter joined the Order, becoming a 57 year old novice in 1866, and making his final vows on 24 June 1867. He then returned to Batavia with a crew of Redemptorists ready to help the lepers. With the added help, Father Peter expanded his work, and began to evangelize the Indians in the region. He learned their languages and had made a good start on the work when his health failed. His superiors transferred him to easier assignments, but as the end approached, Peter returned to Batavia where he worked with the patients until his end. Elder son of Hermias, a Syrian soldier who had retired to Nola, Italy. After his father's death, Felix sold off most of his property and possessions, gave the proceeds to the poor, and pursued a clerical vocation. Ordained by, and worked with Saint Maximus of Nola. When Maximus fled to the mountains to escape the persecution of Decius, Felix was arrested and beaten for his faith instead. Legend says he was freed by an angel so he could help his sick bishop. Felix hid Maximus from soldiers in a vacant building. When the two were safely inside, a spider quickly spun a web over the door, fooling the imperial forces into thinking it was long abandoned, and they left without finding the Christians. The two managed to hide from authorities until the persecution ended with the death of Decius in 251. After Maximus' death, Felix was chosen as bishop of Nola, but declined, favoring Quintus, a “senior” priest who had seven days more experience than Felix. He worked to farm his remaining land, and gave most of the proceeds to people even poorer than himself. 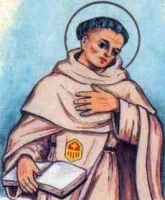 Much of the little information we have about Felix came from the letters and poetry of Saint Paulinus of Nola, who served at a porter at the door of a church dedicated to Saint Felix, and who gathered information about him from churchmen and pilgrims. Though Felix died of natural causes, he is normally listed as a martyr because of the torture, imprisonment, and privations he experienced in the persecutions. Slave. Not originally from Georgia, she may have been brought there by her master when he emigrated, she may have been the spoils of war, or she may have fled her own war-racked homeland and become enslaved after her move to more peaceful Georgia. She cured a dying child by placing her hair shirt on him, and praying over him. News of this miracle reached the Queen of Georgia, who was suffering an unspecified but untreatable malady. She sent for Nino who replied, “I am a slave. My place is not in a palace.” The Queen went to Nino, who cured her by prayer. The royal family offered her any reward; she asked that they convert. The recently healed queen was willing, but King Mirian was not. However, soon after, while on a hunt, he found himself surrounded by wild animals. He made one of those well-known deals with God, offering to convert if he survived. The animals left, and in 325 the king asked Constantine for priests and bishops to spread the faith throughout Georgia. This good work begun, Nino retired to live as a prayerful recluse on a mountainside at Bodbe Monastery, Kakheti, Georgia. 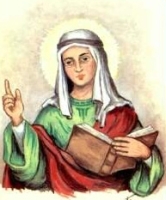 The eldest of ten children born to Angelo and Maria Romano Clerici; hers was a poor but pious family with two of her brothers becoming monks, one sister a Sister of the Precious Blood. Received a Master's degree from the College of the Sisters of the Precious Blood in Monza, Italy. Taught in Lainate, Italy from 1880 to 1883. During her time in college and her work as a teacher, Alfonsa had felt a call to religious life, but her work helped support her family, and she stayed with it. She finally answered the call, and on 15 August 1883 joined the Sisters of the Most Precious Blood in Monza. Teacher at the College in Monza. Director of the College on 22 November 1898. Descendant of Charlemagne through his father, of the dukes of Swabia through his mother. Wealthy count in Westphalia with extensive lands. Layman, married to a noble woman. 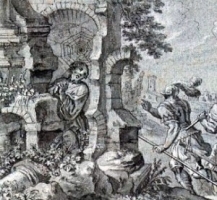 After being brought to an active faith by his friend Saint Norbert of Xanten, Godfrey turned his castle into a Premonstratensian abbey, and in the face of violent family opposition, gave his lands and wealth over to Norbert for use by the Church. He, his brother and his servant, Blessed Giselbert of Cappenberg, then joined the order as monks; Godfrey's wife and two sisters tooks vows as nuns in a convent he founded for them nearby. Built several hospitals and other houses. Was studying for the priesthood when he died. Prince of Serbia, the son of King Stephen I Nemanya. He took the name Sava (Sabas) when he became a monk at Mount Athos. His father later surrendered his crown and became a monk, too, and together they founded the monastery at Chilanari as a house for Serbs. Sava returned home in 1207 when a quarrel between his brothers, Stephen II and Vulkan, broke into civil war. Sava brought monks with him, founded several monasteries, and began the reformation and education of his country, where religion and education had fallen to a low estate. Metropolitan of a new Serbian hierarchy by Emperor Theodore II Laskaris at Nicaea, being reluctantly consecrated by Patriarch Manuel I in 1219. Crowned his brother Stephen II as King of Serbia in 1222. He finished the uniting of his people that had been begun by his father. Translated religious works into Serbian, and gave his people a native clergy and hierarchy. Dispatched to the Holy Land on an ecclesiastical mission, Sava died on the way home. Raised a high-caste Hindu. Knew Sanskrit, Tamil and Malayalam, and studied martial arts and archery. Married layman. Convert, baptized on 14 May 1745 in the diocese of Kottar, India, and taking the name Devasahayam, the Tamil equivalent of the meaning of the name Lazarus. He drew the ire and fell into confrontation with authorities because he mixed with lower castes. Arrested on 23 February 1749 for his faith, he was tortured and abused, and then for three years was hauled from village to village as an example of what would happen to Christian converts. He spent the time in prayer and teaching any who would listen, and priests would sneak him Communion in his cell. Martyr. Joined the Franciscans in 1300. Hermit. Priest. Preacher in northern Italy, drawing large crowds to his services. Missionary through the Near and Far East, preaching in Persia, China, Java, Ceylon, and Tibet from 1316 to 1330. First European to reach the capital of the Dalai-Lama. Known as a miracle worker in China. Died en route to Avignon, France to report his findings to the Pope. The written description of his travels were used as a manual for geographers of his day. Born to the nobility, son of Severianus and Theodora, a couple known for their piety. Brother of Saint Isidore of Seville, Saint Leander of Seville, and Saint Florentina. Bishop of Ecija, Andalusia, Spain, and a leader of the Spanish Church. Attended the Second Council of Seville in 619. Born to a poor peasant family. Hermit in the forest near Passau, Germany. As his reputation for piety and wisdom spread, the people of the region came to him for advice. Murdered by a man who was envious of Engelmaro's popularity. Grandmother of Saint Basil the Great, Saint Gregory of Nyssa, Saint Peter of Sebaste, and Saint Macrina the Younger, and apparently raised Basil. Spiritual student of Saint Gregory Thaumaturgus. She and her husband lived in hiding in a forest at Pontus for seven years during the persecutions of Diocletian, nearly starving several times. Widowed. Born to the nobility, a member of the Alliati family. Known for his learning and his personal piety. Bishop of Milan, Italy c.530. Ordered the history of the Church in Milan known as Historia Datiana. Imprisoned and exiled by Arian Ostrogoths for defending orthodox Christianity. Relocated to Constantinople where he supported Pope Vigilius against Emperor Justinian in the Three Chapters Controversy of 545. Attended the Council of Constantinople in 551 which condemned the Patriarch Mennas. Son of a rich pagan. Convert. Exorcised a demon from the daughter of Emperor Antoninus who then had Potitus arrested, tortured and executed for being a Christian. Martyr. 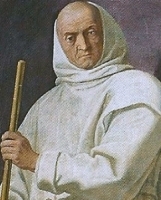 Carthusian monk. Priest. Prior at Geyrach, Slavonia. Following difficulities with his bishop, he resigned his position to become chaplain for several decades to the convent at Tagliacozzo, Italy. Lord of Hauterives, Drôme, France. Father of Blessed Amadeus of Lausanne. With 16 of his men, he retired to become a Cistercian monk at Bonnevaux Abbey, and then he and his son moved to Cluny Abbey, both in France. Founded monasteries at Léoncel, Mazan, Montperout, and Tamis. Bishop of Seleucia and Ctesiphon, Greece in 342. Arrested and tortured with sixteen priests in the persecutions of King Shapur II; the names of his companions have not come down to us. Barbasymas was offered a cup filled with gold coins if he would worship the Persian god; he declined. 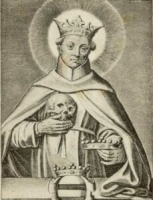 Martyred with the sixteen priests. Franciscan Capuchin priest. Martyred in the Spanish Civil War. Bishop of Arvenia, Aquitaine (modern Clermont-Ferrand, France). Saint Gregory of Tours wrote in praise of him. Premonstratensian monk. Canon of the monastery of Mariënweerd at Utrecht, Netherlands. Archbishop of Vienne, France from 653 to 664. Promoted monasticism in his diocese. Deacon. Tortured and martyred for his faith. Bishop. 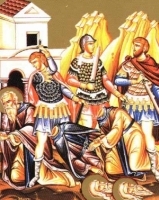 Martyred by Arian Vandals. Martyr. No other information has survived. Priest in Rome, Italy. No other information has survived. A group of 38 monks on Mount Sinai who were martyred by pagan desert Bedouins. We know little about them, have but the names of four of them – Isaias, Jesaja, Sabas and Theodolus. A group of 43 monks in the Raithu Desert near Mount Sinai, Palestine, near the Red Sea. They were martyred for their faith by desert Bedouins. Their names have not come down to us.